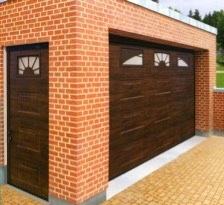 Alutech Garage Doors is a manufacturer of highly insulated quality sectional garage doors. 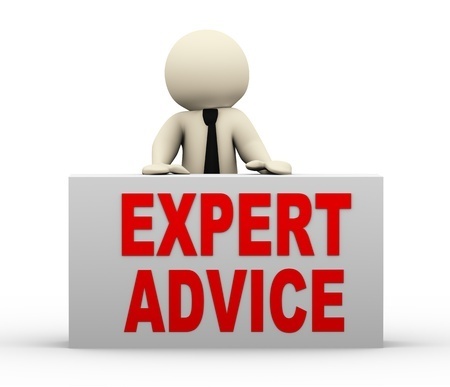 Alutech has been manufacturing high quality, highly insulated sectional garage doors on the continent for many years. 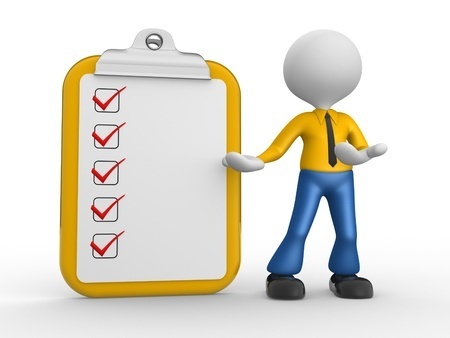 Alutech Garage Doors have had a UK distribution base, with full technical back up since 2013. Weekly deliveries are made nationwide each week. Their high quality and excellent value for many sectional garage doors are becoming a serious challenge to the leading manufacturers. Arridge Garage Doors is an approved supplier of both Alutech Sectional and Alutech Roller Garage Doors. Highly insulated Alutech garage doors. With 45mm door thickness, all round soft rubber seals and a U-Value of 1.0 W/m2K the Alutech sectional door is the most insulated domestic garage door available on the market. Seals between the sections and all round the door prevent draught. Joints between the sections are designed to prevent finger trapping and have soft rubber seals. 45mm thick insulated panels with steel inner and outer skin are very strong and very insulated. In early 2015 Alutech bought out Gunther-Tore Systems of Germany a highly reputed sectional door manufacturer, in July 2015 the Trend door was launched in the UK which is even more competitively priced. 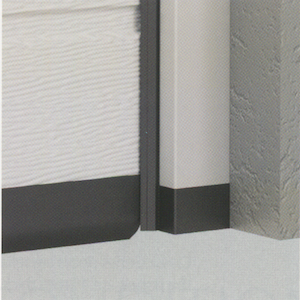 The Trend door is 40mm thick twin walled insulated garage door. It has a U-Value of 1.08 W/m2K. All rollers have sealed ball bearings for extra smooth quiet operation, and all brackets made from sturdy galvanized steel. Doors are available upto 6m wide x 3m high. All doors come with an Avanti belt drive German made motor kit c/w 2 hand transmitters. 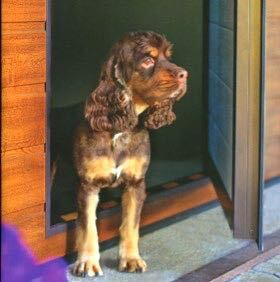 All Alutech Trend doors are made to measure at no extra cost. 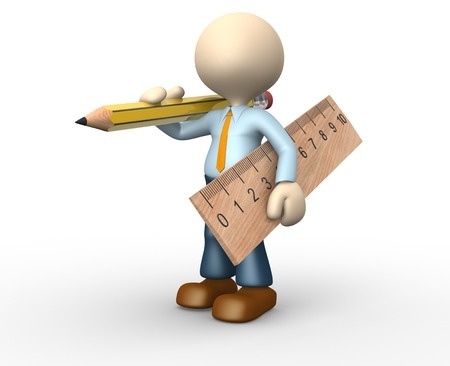 Please send us your sizes in order for us to quote and advise you accurately. Colour matched crossbar and legs means doors can be positioned slightly into the opening if desired, as picture. Very similar system to the Hormann and Carteck range of doors. 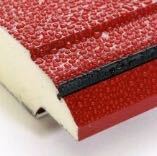 Colour matched legs and crossbar ensure neat installation of your Alutech door. The Classic door is 45 mm thick with a U-Value of 1.0 W/m2K. All roller brackets are made from stainless steel rather than galvanised steel and all rollers have sealed ball bearings for extra smooth quiet operation. The Classic door is slightly more expensive than the Trend door. 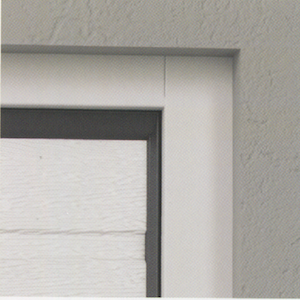 Most customers choose the Trend door due to its slightly easier and quicker installation and lower cost. Protection against corrosion. 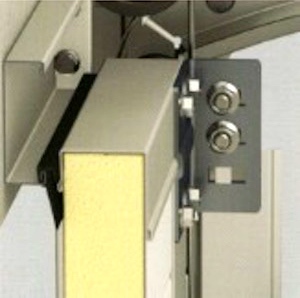 The plastic base of the side leg minimises the possibility of corrosion if the frame leg is exposed to water build up at the base of the door. Matches up nicely with deep black bottom rubber on the door. Long operational life of the garage door spring mechanism. 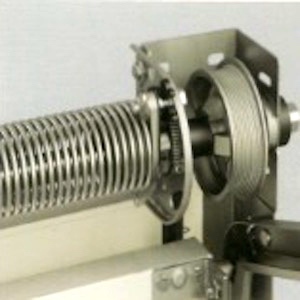 Springs are rated to 25,000 open/close cycles. This corresponds with 17 years service of 4 open/close cycles per day. Very safe garage door. 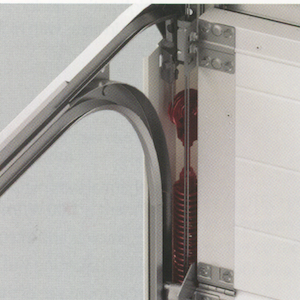 The Torsion Spring mechanism on the double doors is equipped with a fall-arrest system which stops the door from falling closed in the unlikely event of a spring breakage. 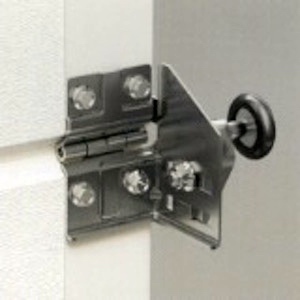 On single doors the double cable arrangement each side of the door acts as a similar fail-safe device. All Alutech Gunter doors comply with European Standard EN 13241-1, EN 12604, EN 12453, EN 12424, EN 12425, EN 12426. 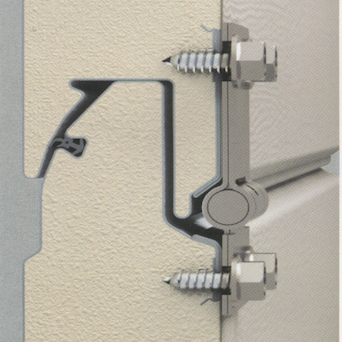 The door has intermediate seals between each section and a deep rubber seal all round the perimeter of the door, built into the frame. Adjustable top roller brackets allow the top panel to be adjusted perfectly against the top rubber seal. It keeps draughts out and keeps the warmth in. Alutech are one of the few leading manufacturers who include a ball race ball bearings built into the rollers. These ensure extra smooth and very quiet operation of the door. 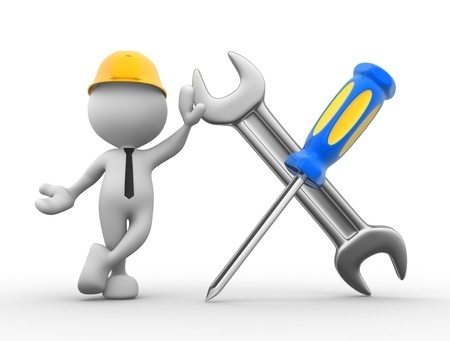 The bearings are sealed from dust and moisture and do not need lubricating. Lead time. Highly automated factories in Germany and Belarus produce the doors and ship them to the UK on an approximately 4 week lead time. Corrosion resistant frame leg bases. Well engineered robust counterbalance mechanism and tracking. CE compliant anti-drop mechanism ensures that the Alutech is extra safe. 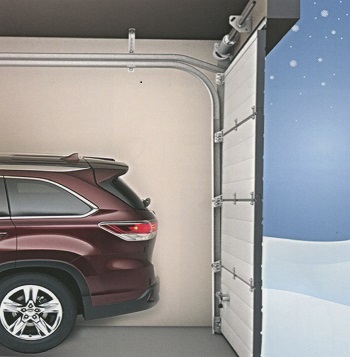 Top panel of the sectional garage door crushes against the deep rubber seal. Ball race ball bearings ensure smooth, quiet door operation. Alutech matching side doors available. Inbuilt wicket doors, built into the main garage door are available at extra cost. 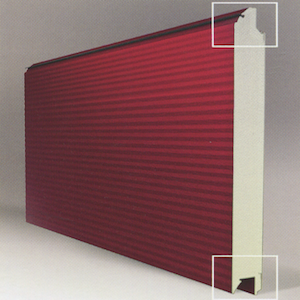 Long lasting protective coating on multi-coated sandwich panels and side profiles.